Successful businesses are driven by more than strong performance and bottom-line results. If this year’s Business of the Year honorees are any indication, “family” plays a significant role in organizational success. It’s not surprising. Researchers note people spend as much – or more – time at work than at any other single activity, other than sleeping. Many of the 2019 honorees spoke to the importance of having a collegial, family-like bond across the C-Suite. They work, strategize paths and celebrate wins together. Many break bread, travel or just spend time together, whether as a regular occurrence or as a bonding event across the organization. As more banks sell around Miami, those that remain are focusing on tech upgrades and diversifying their loan portfolios to remain relevant. There have been 24 whole-bank deals in Florida since early 2018, with several Miami-area banks among the sellers. They include TotalBank, FCB Financial and Gibraltar Private Bank. Another seller was TransCapital Bank in Sunrise, Fla., which agreed in March to be sold to the $655 million-asset Power Financial Credit Union in Pembroke Pines. Banesco USA in Coral Gables, Fla., recently received more than $11 million in capital, which it plans to reinvest in new mobile and online banking platforms. Jorge Salas, the $1.3 billion-asset bank’s president and CEO, said it embarked on a series of new fintech partnerships last year. In April it announced an alliance with Plug and Play that allows Banesco to leverage the Silicon Valley company’s platform to upgrade its consumer and commercial offerings, Salas said. Banesco USA has been named a finalist for the 2019 Business of the year Award by South Florida Business Journal. This prestigious award has recognized many of today’s top regional organizations, so we are proud to participate in the annual 22nd Business of the Year award program. SFBJ is one of South Florida’s most reliable and leading business news outlet in South Florida covering the latest stories on the market. Founded in 2006 and based in Coral Gables, Banesco USA is an independent Florida state-chartered bank (https://banescousa.com/OFR-Cert-of-Good-Standing.pdf) with $1.28 billion in assets as of December 31st, 2018. Banesco USA is completely independent of Banesco in other countries and its deposits are insured by the FDIC. The bank has four branches in South Florida: Coral Gables, Doral, Hialeah and Weston; and one in San Juan, Puerto Rico. It plans to open a branch in Aventura, FL in first quarter of 2019. Banesco USA has a 5-star rating from the Bauer Financial rating service and a BB- Fitch Rating. Visit www.BanescoUSA.com for information. Banesco USA announced today an alliance with Plug and Play, one of the largest innovation platforms located in Silicon Valley, in support of its digital transformation strategy. In Banesco USA we are not closing branches. On the contrary, we are opening Signature Branches. In this article Jake Martin from Bank Innovation reports on how some banks, like Banesco USA; are figuring out ways to transform the branch banking experience. Our new branch concept that we are excited to unveil to our community, will feature Interactive Teller Machines (ITM) with remote tellers, Video-conferencing rooms, a unique interior design and a team of business bankers ready to offer the personal service our customers deserve. Working with $11.9 million from its shareholders to continue growing and investing in technology this year, Banesco USA entered into an agreement recently with Silicon Valley-based accelerator Plug and Play Fintech. The Coral Gables, Fla.-based bank may be a community bank, but it’s thinking big when it comes to digital transformation. President and CEO Jorge Salas said the bank can do no less, considering the changes in how people consume financial services and what they expect from financial institutions. We couldn’t feel prouder, our very own CEO & President Jorge Salas, was named once again a Power Leader by the South Florida Business Journal. “It comes down to the positive things the bank creates in our community. We help entrepreneurs and business men and women fulfill their dreams. I take very seriously the notion that banking isa a community service”. The South Florida Business Journal is the leading business news outlet covering Broward, Miami-Dade and Palm Beach counties. We believe in the importance of real-world experience for our future generations. In Banesco USA we offer internship programs that expose our interns to different scenarios within the financial industry. We offer a dynamic and agile environment, invaluable team experiences with great opportunities to shine. Our interns are placed into a real role with real responsibilities. They have the opportunity to participate in activities and projects that encourage professional development. Our interns become part of our team further more our family. Check out this short video. Our 2018 summer interns share their experiences. Are you interested in participating? Write us an email to internships@BanescoUSA.com. 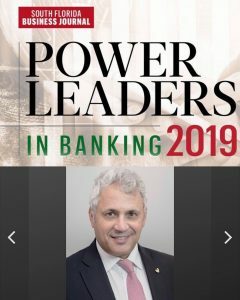 Banesco USA received a $11.9 million capital injection from its shareholders to jump-start its growth and digital offerings in 2019, the bank announced on Monday. The news follows a record-breaking year for the Coral Gables-based bank, which saw its assets reach $1.25 billion in 2018. Banesco USA will use the $11.9 million to support its technology innovations, including financial tech partnerships, and website and mobile banking redesigns, said President and CEO Jorge Salas. Established in 2006, Banesco USA has three branches in Miami-Dade, one in Broward and one in Puerto Rico. Salas said the bank will open a new, signature branch in Aventura during the first quarter of 2019. The location, he said, will feature an open-space concept, with room for customer seating and no teller lines. There’s a revolution, of sorts, transforming the banking industry, as large and small banks alike invest in financial technology and rethink their culture to broaden their appeal and lure younger customers into the fold. At least a decade ago, big banks were quick to invest enormous sums to build state-of-the-art web and mobile banking platforms. But the costs linked to those innovations meant community banks were late to the game, with some now just beginning to invest in the digital tech that customers have come to demand from banks. To say community banks are scrambling to play catch-up with online banking isn’t an understatement. But they’re doing so at a time when more of them fight for their existence due to the steady stream of mergers and acquisitions that slashed the number of local banks in South Florida. It’s a trend of utmost concern to small businesses, which have long depended on community banks as a chief source of financing. Meanwhile, the institutions that persist are not only revamping their websites and mobile platforms but reinventing their hiring practices and redesigning branches to stay relevant. It’s all part of their multi-prong strategies to retain existing customers and lure new ones in a world increasingly altered by the convenience and personalization of tech and how millennials like to do business.